The Jumbo Valley, located deep in the wilds of British Columbia’s Purcell Mountains, has long been revered for its spiritual significance and beauty. To the Ktunaxa Nation, it is known as Qat’muk, home of the grizzly bear spirit. Part of a crucial international wildlife corridor, the Jumbo Valley is one of only two remaining areas in North America where bears can freely roam between Canada and the US. Permanent development of the valley would likely lead to reduced grizzly populations locally, regionally and even continentally. For more than 25 years, local people—First Nations, skiers, riders, alpinists and conservationists—have fought a proposed large-scale ski resort in Jumbo. The Ktunaxa First Nation’s Qat’muk Declaration asserts that the Jumbo Valley is of significant spiritual and ecological importance and calls for its permanent protection. We all need the wild—clean water to drink, open spaces to run, animals to remind us of our nature, mountain peaks to connect us to something bigger than ourselves. We’re delighted to present a short film made by Sweetgrass Productions and sponsored by Patagonia about the urgent need to keep Jumbo wild. 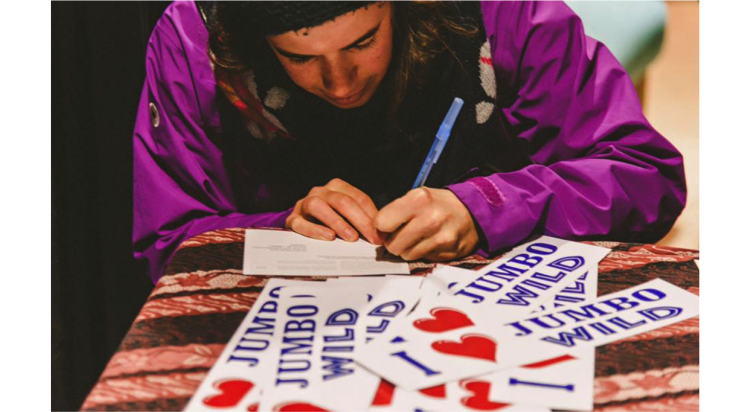 To learn more about the issues surrounding the proposed resort or to sign the petition asking for permanent protection of the Jumbo Valley, visit our Jumbo Wild website. Header Photo by Cori Gadomski. Inset photo by Agathe Bernard.